The Australian Bodycare Exfoliating Body Scrub is a fairly new release from the brand that promises to clean and moisturise the skin whilst the eco-friendly, non-abrasive particles scrub away at dead skin to leave it feeling smooth. It comes packaged in a squeezy blue tube that holds 150ml of product. The exfoliator itself is a light blue gel whilst the particles are white in colour. It has a light, Tea Tree Oil scent that lingers whilst you use it, but disappears when rinsed. The exfoliating pieces are pretty saturated throughout the mix, but when on the skin they spread out nicely. They are also fairly large when you see them, but they are small enough to gently scrub without causing any irritation. I find that this sloughs off the dead skin really well and leaves the skin feeling and looking smoother. It also leaves it nicely hydrated and moisturised, but not to the extent that you can skip on your moisturiser. I'm absolutely loving this Exfoliating Body Scrub. It isn't the type of product that you need to use every day as it does such a good job, but it is a fab item to add into your routine a couple of times a week for sure. I personally love how renewed the skin looks after use. You can tell it's done its job, even after the first time using it. 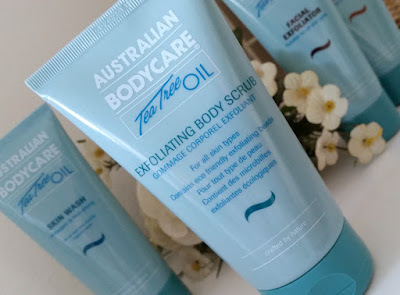 If you are after a good body exfoliator, I definitely recommend checking this one out. Like the Exfoliating Body Wash, the Facial Exfoliator is also a new release from the brand. It promises to provide a brighter, clearer complexion by fighting blemishes and removing dead skin. As well as Tea Tree Oil, it contains Papaya Extract to remove dead skin cells and Bisobolol to soothe. It is free of SLS, parabens and Polyethylene Beads, instead using Cellulose Acetate as the scrub. It comes packaged in the same style of a squeezy blue tube, but this time in a slightly smaller size. 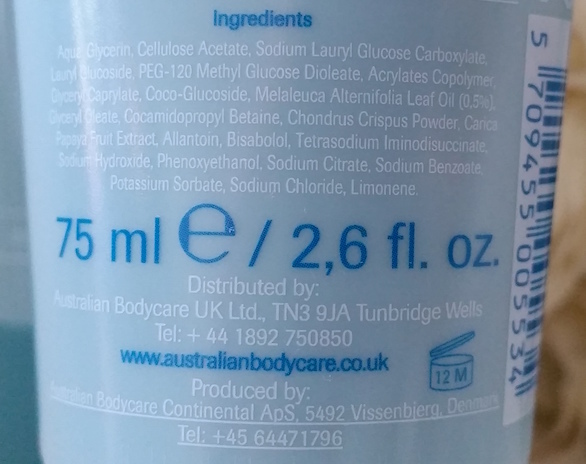 It's worth noting that even though the bottle size is the same as the Skin Wash (below), the Exfoliator actually contains 25ml less, only containing 75ml instead of 100ml. To use, apply to wet skin and gently massage before rinsing thoroughly and patting dry. 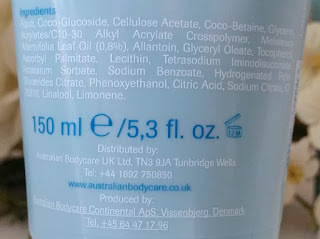 Australian Bodycare recommend using this no more than twice a week. As with the rest of the range, the Facial Exfoliator has a light, Tea Tree scent to it that yet again disappears upon rinsing. It is pretty gritty in texture, but not to the extent that the pieces will scratch your face up. Instead, they are light on the skin, but still pretty mighty. Once rinsed, it leaves the skin looking clean and clear whilst feeling soft and smooth. It isn't drying or irritating, prepping it perfectly for the rest of your routine. I have to say that I am really enjoying this face scrub. It does a great job without being harsh on the face (which you don't want). It is also great for all skin types as it isn't drying, instead leaving the skin bright and hydrated. Hurrah! The Skin Wash is a gentle, antiseptic body wash that is good for every day use. It claims to be good for dry skin and minor skin ailments (more on this in a sec) as well as leaving the skin hygienically clean. The size that I have here is the 100ml bottle that comes packaged in the same, squeezy blue tube, but it also comes in larger sizes that come in pump bottles instead. The product itself is a light, transparent blue gel. It lathers up easily on the skin and leaves it feeling rejuvenated and refreshed whilst also leaving it soft to the touch. Whilst it is fab for all ages as a general daily body wash, it also has some extra benefits. 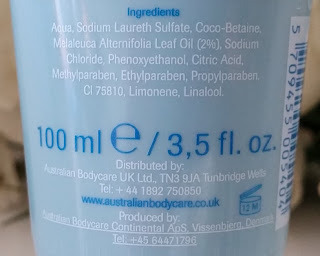 If you suffer from excessive body odour, bad smelling feet or something along those lines, a wash like this is always a good call due to the Tea Tree Oil. As I explained at the start of the post, Tea Tree is a natural antiseptic and this will also help to get rid of the bacteria that causes body odours. In addition, if you suffer from breakouts on your body, such as on your back or chest, the Tea Tree in this wash can help to reduce them. It is also good for other minor skin issues that you may be dealing with. I'm really liking this Skin Wash so far. I love the gentleness and how hydrating yet lightweight it is. The Tea Tree smells so clean, so it's a lovely scent to bathe in and freshen yourself up with. The larger sizes are particularly great for a family home as it is suitable for everybody and deals with so many common issues that different people face. The Cleansing Face Mask is a clay-based formula that helps to brighten, exfoliate and deeply cleanse the skin. 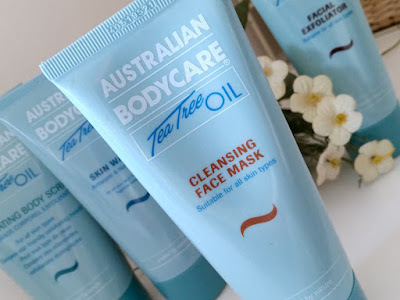 As well as Tea Tree Oil, it contains Macedamia Oil to soothe, mineral rich clay for a deep clean, and Papaya Extract to exfoliate and brighten. 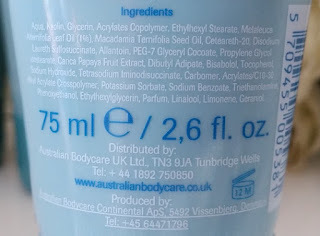 It comes packaged in the same squeezy blue tube, but like the Facial Exfoliator it only contains 75ml of product. The mask itself is thick and a bright, pale blue in colour. To use, apply a generous layer onto clean, dry skin. Leave on for 10 minutes and then rinse. Follow up with a moisturiser. Australian Bodycare recommend using this at least once a week for the best results. The mask is easy to apply and you begin to feel the cooling sensation the second it touches your skin. Better yet, that feeling lasts until the mask has dried. It does dry quite quickly, but the time it takes will vary depending on how much you apply. I managed to get it spread fairly evenly across the face, but naturally a couple of places ended up with a bit more than others. These parts took longer to dry when the rest had already done so. When it is dry, it is almost not visible. Removal is fairly straightforward which is good as some masks can take a while to remove. Once it has gone, the skin is left looking incredibly clear and oil is visibly reduced. It also isn't drying to the skin, so it is suitable for all skin types. I really like this Cleansing Face Mask. The cooling effect is nice, but at the same time you can tell that it is getting to work. It also isn't harsh on the skin, so even though it's cooling and reducing oil, your skin isn't left feeling tight, uncomfortable and dehydrated. I'd say that the amount of times you use this per week may depend on your skin type. If you have oily, blemish-prone skin, you may want to use it twice a week or so. If you have drier or clearer skin, once may be enough. This is down to each individual though, but I definitely recommend at least one per week if you choose to purchase it. I tried out the Australian Bodycare Blemish Stick last year and I really loved it. These products are also all great items that I genuinely enjoy using. Importantly, each of them work and they do what they say on the bottle, but at the same time they all just have this fantastic rejuvenating feel to them. No matter which product it is that you use, you just feel (without meaning to seriously overuse this word within this review) clean. This is a brand that I would definitely describe as refreshing, but in more ways than one. As well as being refreshing in the physical sense, it is also refreshing to know that there is a brand out there that will provide that feeling with products that work for you. I find it difficult to choose one product over the other out of this bunch that I have reviewed today. I highly recommend trying out all of them if you haven't yet done so. 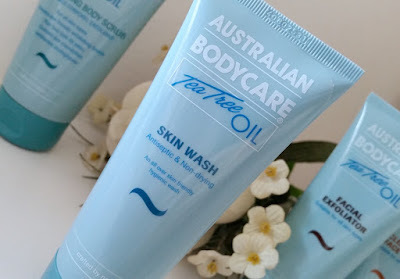 If you want to see some more from Australian Bodycare, make sure you check back next week for a whole extra bunch of products that I'll be reviewing! You can purchase all of the above products from Look Fantastic. 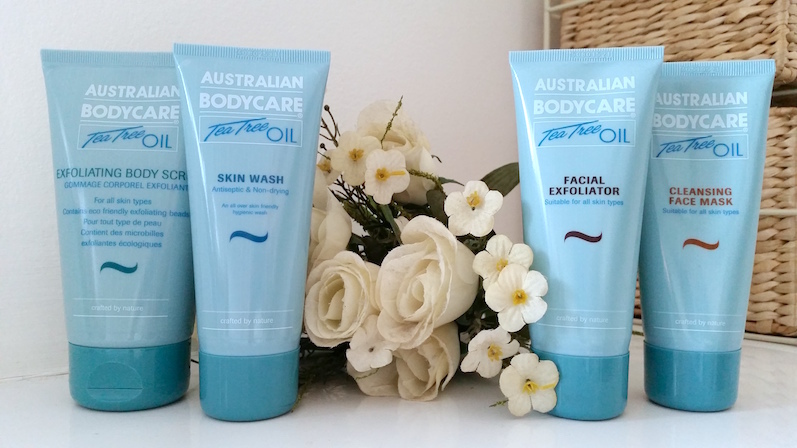 What are your thoughts on the Australian Bodycare products featured in this post? Which is your favourite?